American agriculture is undergoing a new wave of productivity and enhanced sustainability. While many previous advances focused on enhancing a plant’s internal ability to overcome natural challenges, this next wave focuses on the critical interactions between plants and the surrounding microbiome. In recent years, there has been a renewed emphasis on improving soil health. This next wave focuses on the interactions between a growing crop and the microbial community in and around the soil. This is an incredibly complex endeavor to identify those microbes that are beneficial in improving yield, increasing nutrient efficiency, improving abiotic stress tolerance or protecting against harmful pests and diseases. A recently released business study “Plant Microbiome, The Next Wave in Agriculture?,” conducted by BioCognito and Farmgate Insights, takes a multifaceted look at this expanding field of agriculture. Microbial additives or “biologics” are becoming an important approach for farmers looking for ways to manage production challenges. understanding the market for biologicals for row crops. In support of the study, the authors have created an interactive cost-benefit model for each crop to help farmers or industry assess the value of a new product. 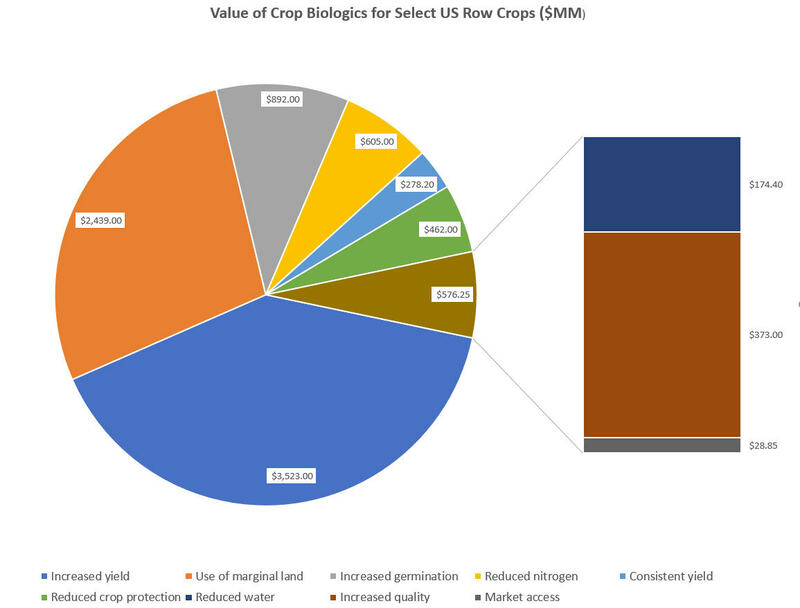 “Our models indicate value creation in excess of $8.5 billion in farmgate revenue for these five crops in the US alone. This value is largely driven by yield increases and the ability to utilize marginal land, however a number of other drivers were important. According to co-author Nathan Danielson “We used conservative assumptions in our models and still saw very significant new value creation. Beyond this, there were specific geographies and market sectors that were really exciting opportunities”. The reward for capturing market share is enormous. Corn, cotton, soybeans, sorghum and wheat represent a significant opportunity for crop biologics. The market study “Plant Microbiome: The Next Wave in Agriculture” provides the reader with a clear understanding of the landscape of the market place. This is accomplished through analysis on market structure and barriers to entry as well insights into market participants and those who may enter. Finally, customizable models are provided to readers to allow value determination for specific crops and geographies.